Dhaka, 28 April, Abnews: Noting that Bangladesh needs greater human capacity as it is going to the next stage of development through graduation from the LDC, Prime Minister Sheikh Hasina on Saturday sought Australian cooperation to this end. “As Bangladesh is going to the next stage of development through graduation from LDC, we need greater human capacity where Australia can contribute by providing training-type programmes and vocational education,” she said. While paying a visit to Western Sydney University, the Prime Minister also sought Australian cooperation in developing an inclusive and people-centric blue economy. “Bangladesh is planning to develop inclusive and people-centric blue economy enhancing capacity-building with innovative financing, ensuring transfer of critical technology, and strengthening cross-sectoral partnerships and collaboration from Australia,” she said. Sheikh Hasina sought technical assistance for development of Bangladesh’s marine aquaculture and exchange of teachers on oceanography. She urged Bangladeshi students studying at the university to take advantage of the best knowledge that this university can offer. She mentioned that Bangladesh has been enjoying warm relations with Australia since Australia’s recognition to independent Bangladesh on January 31, 1972. “Very fundamental of bilateral relations between Bangladesh and Australia originates from the fact that Australia was the first country from the developed world to recognise our independence,” she said. The Prime Minister recalled that after the declaration of independence by the Father of the Nation on March 26, 1971, he called upon the people of Bangladesh to fight for independence. “We offer homage to the world leaders who stood by our side during our Liberation War and the early years of our nationhood. Amongst the world leaders who championed our cause for liberation, Edward Gough Whitlam was one of them. Whitlam played a leading role in building a bipartisan consensus about Bangladesh as the leader of the opposition in the Australian Federal Parliament in 1971,” she said. Hasina mentioned that Whitlam also raised the plight of the humanitarian sufferings at the hands of the Pakistani occupation forces and their local collaborators at that time. He played an important role in lobbying with the international community for Bangladesh to be recognised by the Commonwealth and other countries, she said. “Edward Whitlam visited Bangladesh on January 19, 1975. It was the first and last visit by a prime minister of Australia to Bangladesh,” the Prime Minister recalled. She also recalled with gratitude the contribution of Australian national William AS Ouderland during the War of Liberation for which he was given gallantry award ‘Bir Protik’ and awarded with ‘Friends of Bangladesh War of Liberation War 1971’. 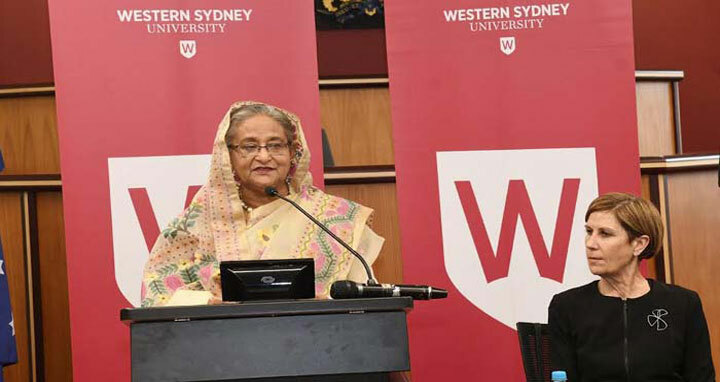 The Prime Minister said Australia has been a favourite destination for higher studies for Bangladeshi students and currently, some 200 students are studying in Western Sydney University. “Western Sydney University's present collaboration with Bangladesh is strengthening capacity of our judiciary management and providing training programme for Department of Oceanography, University of Dhaka and Bangabandhu Sheikh Mujibur Rahman Maritime University to enhance their knowledge and skills in ocean governance,” she said. "The students who are here shouldn't only obtain degrees rather they have many things to learn," she said. Mentioning that her government solved maritime boundary disputes with two neighbouring countries, Hasina said, "We have to utilise our maritime resources, which can contribute to the economic development of our country." She said Bangladesh is a country of 16 crore people. "We have to provide them with all the things, including food and security." "Actually, Bangladesh is a small country with a large population. So, we can give special attention to how to utilise maritime resources. There are many things to learn from Australia. The students who are here should given a special attention to this matter." Noting that Bangladesh is now setting up coal-fired power plants, Hasina said coal is being imparted from Australia and Indonesia for the power plants. The Prime Minister paid homage to Father of the Nation Bangabandhu Sheikh Mujibur Rahman placing a wreath at the Bust of Bangabandhu on the University campus. The Bust of the Father of the Nation was unveiled by Law, Justice Parliamentary Affairs Anisul Huq in February, 2017. Leaders and activists of Australia chapter of Awami League greeted the Prime Minister with a bouquet there. Later, a delegation of RMIT University, Melbourne, Australia met Prime Minister Sheikh Hasina at her hotel suite here. The delegation, led by Professor Geoffrey Strokes, deputy pro-vice-chancellor of the university, shared the unreleased report of a study conducted over remittances flow to Bangladesh and the way of better use of the remittances to improve economic, social and civic outcomes. The study on "Migrant Family Motivation Initiative" (MFMI) has been conducted in Khosha, Shibaloya, Balia Kandi and Phulpur upazilas of Bangladesh aimed at creating a platform for migrant workers and their families to facilitate the more informed use of remittance income and converting unemployed migrant family members , especially rural women, into productive human resources. Prof. Supriya Singh, Prof. Shadat Khan and Prof. Graham Airey of RMIT University and Prof. QUamrul Alam of Central Queens University were among the delegation members.